Using machine learning technologies we continuously analyze user profile based on what is happening during the session (typical scenario of legitimate user vs fraudster) and how the user behaves (bio-chronometrics with number of criteria: velocity & navigation, mouse movement, keystrokes, typing cadence, delays etc). This allows us to identify against previous sessions if a legitimate user or fraudster is logged in. Inside our device fingerprinting technology wide range of algorithms analyses the same set of parameters to provide advanced dynamic analysis. It allows to differentiate normal device evolution (OS, browser updates etc) from suspicious changes. Precise fingerprinting can be also applied to investigate money laundering and illegal cashing out networks when several accounts are used from the same device even when TOR, proxy or «anonymizers» are applied. Advanced device fingerprinting allows to highlight malicious activity across separate clients. Patented clientless detection allows Secure Portalto identify infected client devices without impacting client experience as no installation is required. We catch PC and mobile trojans (including those using web-fakes), web-injects, remote access and social engineering cases. For each case we give wide context, collect injects, C&Cs, and other data to investigate attacks. We integrate Group-IB Threat Intelligence (recognized among the top by IDC, Gartner, Forrester) data on threat actors, malware intelligence, malicious IPs and compromised data (logins, passwords, bank cards) into Secure Bank. This allows us to track campaigns, identify web-injects (man-in-the-browser attacks) and actors to give additional insights and actionable intelligence to anti-fraud and cyber security teams. By cross-referencing anonymized data, Secure Portalcreates global user profiles across different online banking channels. This gives us understanding of affinities between users, accounts and sessions to identify good vs bad users with less friction and higher accuracy rates. Our unique threat intelligence stack and Secure Portal analysis on other client identifiers allow us to detect hidden threats and suspicious connections. Advanced Rule Engine allows to adopt existing rules or create new ones to fight with fraudsters schemes, specific to your business. You can create your own risk score model, enhance it to stay effective in a changing environment. Secure Portal can be deployed via a Software Development Kit, that is easily integrated with customer mobile applications. Its anti-fraud functionality allows to identify mobile devices and discover malicious apps on Android and iOS. By cross-referencing anonymized data, Secure Portal creates global user profiles across different online banking channels. This gives us understanding of affinities between users, accounts and sessions to identify good vs bad users with less friction and higher accuracy rates. Our unique threat intelligence stack and Secure Portal analysis on other client identifiers allow us to detect hidden threats and suspicious connections. Patented clientless detection allows Secure Bank to identify infected client devices without impacting client experience as no installation is required. We catch PC and mobile trojans (including those using web-fakes), web-injects, remote access and social engineering cases. For each case we give wide context, collect injects, C&Cs, and other data to investigate attacks. 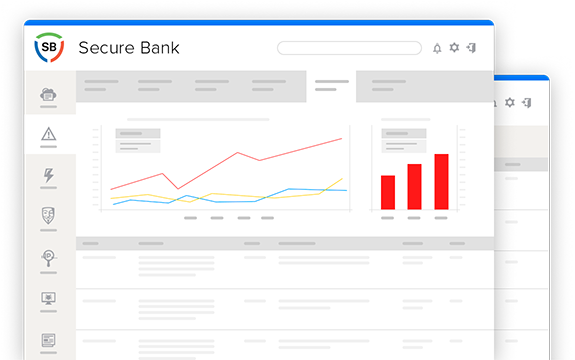 By cross-referencing anonymized data, Secure Bank creates global user profiles across different online banking channels. This gives us understanding of affinities between users, accounts and sessions to identify good vs bad users with less friction and higher accuracy rates. Our unique threat intelligence stack and Secure Bank analysis on other client identifiers allow us to detect hidden threats and suspicious connections. Secure Bank can be deployed via a Software Development Kit, that is easily integrated with customer mobile applications. Its anti-fraud functionality allows to identify mobile devices and discover malicious apps on Android and iOS.